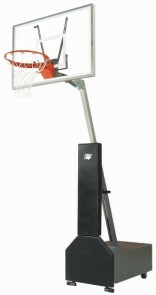 Club Court Portable by Bison, Inc.
Now Available with 54" Glass Backboard upgrade for only $260.00 (select above, see photo below). 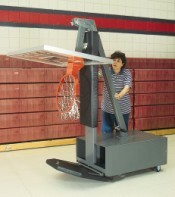 Rim Height Adjusts From 6-1/2' to 10' for all ages of play. Free Shipping with Free Lift Gate Service. YOUR CHOICE OF CLEAR OR SMOKED ACRYLIC BACKBOARD or UPGRADE TO A TEMPERED GLASS BACKBOARD. Institutional Grade. Indoor or Outdoor use! Let the good times roll! Finally there is portable system that can easily be moved by one person. The 4 wheel design is the key. If you actually need to move your system each time to play on it don't buy one of those water or sand filled plastic base systems, they are next to impossible to move. Cheaper systems only have 2 wheels and you need to tip the system when trying to move it. This 4 wheel portable is a great system, shop around and compare these features. BACKBOARD: 48" X 32" in your choice of 3/8" Clear Acrylic or 3/8" Smoked Acrylic (select above). Now available with a 54" x 36" Tempered Glass Backboard for only $260.00 (select above, see photo below). Tempered glass is the best backboard choice for superior rebound and won't scratch like acrylic can. 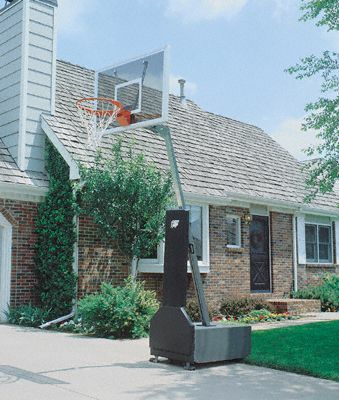 Both acrylic and glass backboards have a warranty against breakage during dunking because the rim is bolted directly to the pole system and not to the backboard. You don't have to worry if someone hangs on the rim. 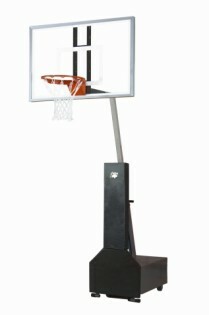 Backboard extension is 36" from the base with the acrylic backboard and 30" with the glass backboard. PORTABLE BASE: Heavy Duty 4 wheel system allows for easy one person movability. Watch out for plastic base water or sand filled systems that are impossible to move around. Large capacity weight box permanently holds 325 pounds of customer supplied concrete blocks for ballast. No water of sand ballast on this system. Concrete blocks can be purchased at any home improvement store for very little cost. Rubber feet provide excellent stability in the playing position. Base size is 29" wide and 41" long. True One Person Moveability Indoors or Outdoors! 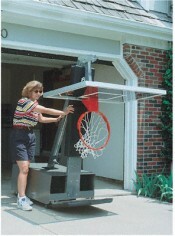 ADJUSTMENT SYSTEM: Spring-assisted telescoping adjustment system makes rim height adjustment very easy. Adjusts anywhere between 6 1/2' and 10' and includes a goal height indicator. Top folds down to a storage height 78" to fit through a standard garage or door opening. 48" Acrylic. 54" Tempered Glass. We proudly use ABF Freight System, Inc. to ship our basketball hoops. North America's most trusted carrier, they provide our customers with Award Winning curb side service throughout the US and Canada. Free Lift Gate Service is provided where required. Shipping Weight 450 lbs. in 3 cartons. 2 - 3 Save $50.00 ea.